If you're an experienced Windows user, you don't need a guide to everything that Windows 8 can do, just to those tools and functions that work on your tablet. And so here it is. This new book zeros in on what you need to know to work best on your tablet with Windows 8. Topics include navigating the new Windows 8 interface and how it works on a touchscreen, how to safely connect to the Internet, how to work with apps or share your tablet in a group, and much more. If you're a new tablet user, you'll particularly appreciate the fresh guidance on storing files in the cloud, finding tools on the new Windows app store, and tablet troubleshooting. 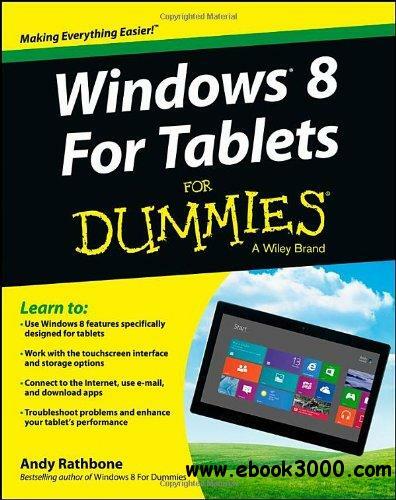 Keep Windows 8 For Tablets For Dummies close at hand and get the very most out of your Windows 8 tablet.